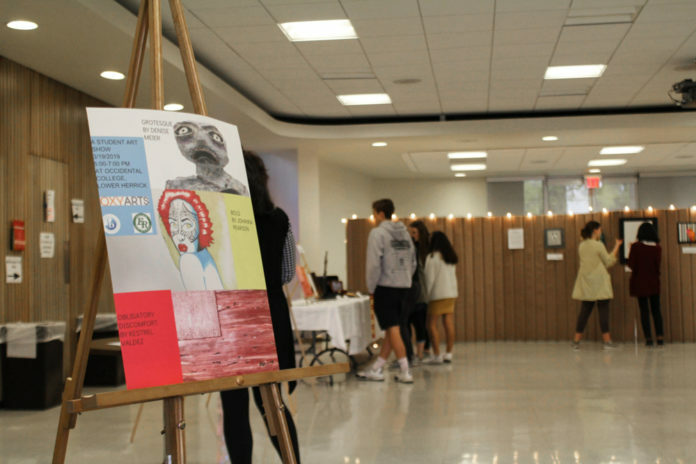 Eagle Rock High School (ERHS) seniors Kestrel Valdez, Johanna Pearson and Denise Meier did not shy away from confronting their audience with visually stimulating pieces titled “Grotesque,” “Obligatory Discomfort” and “Bold” during an exhibition at Occidental College March 19. 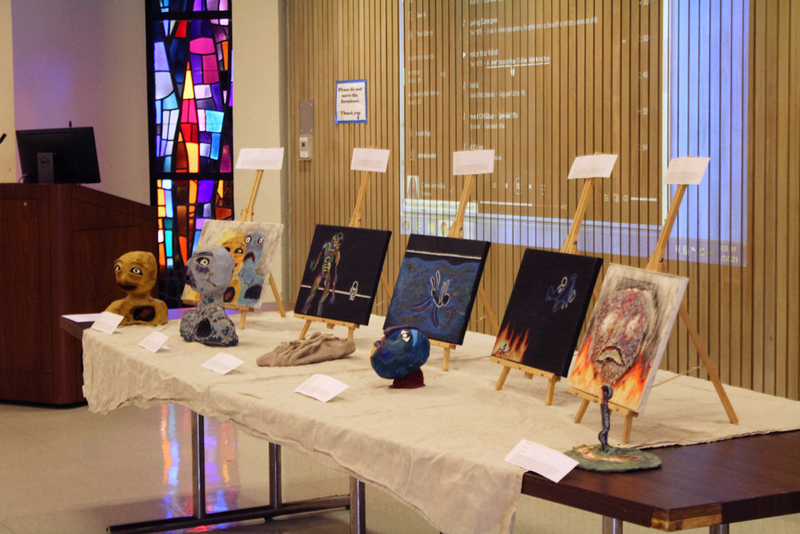 Located in Lower Herrick, students of ERHS art teacher Pablo Oliveros were assigned the task of creating their own art show complete with music, lighting, food and most importantly, pieces of artwork from their two-year long International Baccalaureate (IB) program. The partnership between ERHS’ art program and Occidental began three years ago and is overseen by Oxy Arts Coordinator of Community Programs Allegra Padilla. Valdez explained the project they were assigned and what she gained from the experience. Similarly, Pearson found the process of putting on an art show to be a taste of what it would be like to be an artist in the real world. Not only did the students set up the venue, they had the task of showcasing their work and explaining its significance. Meier said she drew inspiration from professional artists such as Paul Klee, an artist known for his individual style influenced by cubism, surrealism and other abstract movements. Valdez also drew inspiration for her series entitled “Obligatory Discomfort” from Henri Matisse, who typically used pure, bright colors to grab his audience’s attention. Her subject matter followed this style of painting as it addressed subjects not routinely discussed but still important due to their influence on youth, such as puberty and the difficulties of adolescence. Beyond drawing inspiration from previous artists, Pearson drew the inspiration for her show from the community she grew up within Eagle Rock. Oliveros said he stands behind the project he assigns his students and feels it allows them to apply what they’ve learned in the classroom to real life. Beyond just improving and utilizing real-world skills, Oliveros emphasized the fact that his students are experiencing life in the real world through artistic means. The collaborative nature of this show between the local high school community and Occidental is something both Oliveros and Padilla stressed the importance of. Connections to the community are hard to come by and maintain but offer a lot in return, according to Padilla. Oliveros echoed these sentiments and emphasized the importance of the link between Occidental and ERHS. 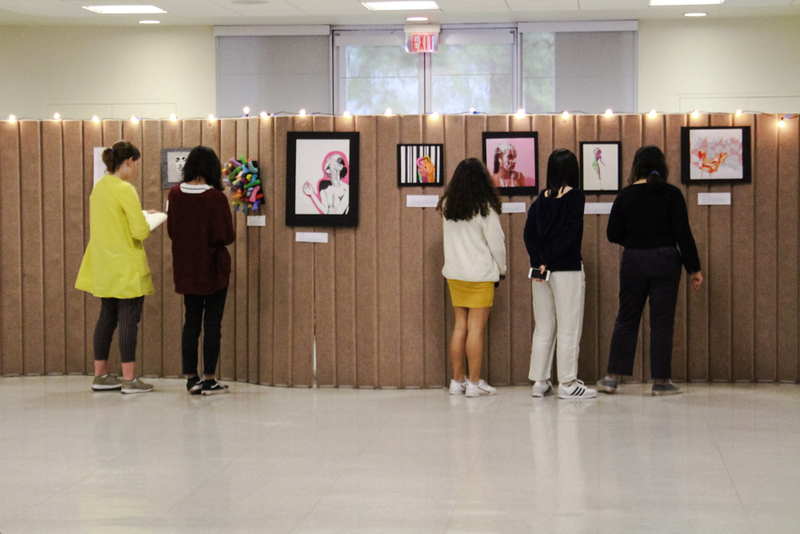 The connection Oxy Arts has fostered with the ERHS arts program is just one example of the community outreach the office wishes to achieve, according to Padilla. Creating community spaces in which creativity and collaboration are a priority is something Padilla hopes will fundamentally change the way the Occidental community interacts with the broader Los Angeles community and hopefully have a lasting, positive impact. For Padilla and Oliveros, the ERHS art project is just one example of the positive impact of collaboration between the local community and Occidental. It offers a space in which students like Valdez, Pearson and Meier can share their artistic achievements with the community at large, an opportunity few high schoolers get the chance to experience.